Late one night, as a sumo wrestler slumbers, a group of burglars break into his home and kidnap his jet-black Chihuahua, leaving behind a threatening ransom note. Later, back at the park, the Turtles, Splinter, April, Ninjara, Fu Sheng, Chu Hsi and Oyuki are listening to the pleas of the street gang who have come to the Turtles seeking help on behalf of their friend, Tai San. Tai San arrives late to the pow-wow on his motorcycle, turning out to be a hulking, but friendly, sumo wrestler. Tai San explains that his dog, Inky, is being held for ransom by a pair of racketeers named the Yen Brothers. If Tai San throws his next match, Inky lives. If Tai San wins, Inky dies. The heroes vow to help him in his plight and Leo quickly hatches a plan. Tai San will attend his match as scheduled so that the Yen Brothers will let their guard down. Meanwhile, one team will infiltrate the Yen Bros headquarters to save Inky while a second group watches over Tai San to protect him from any reprisals once the Yens catch on. That evening, at Sumo Fest ’92 presented by Stump International Wrestling, Tai San faces his opponent, Mu Pho, as planned… but under his stage name: Tattoo! As he engages Mu Pho in battle, our heroes look on. They spot the Yen Bros watching from their (heavily guarded) seats. Meanwhile, outside the Yen Bros HQ, Ninjara, Raph and Leo scale the building, trying not to look down. They break in and disarm the guards (Leo delivering a blunt anti-gun PSA all the while). They find Inky locked in a closet, though the pup seems a little irritable. Back at the stadium, Tattoo conquers Mu Pho, much to the rage of the Yen Bros. In the locker room, Tattoo basks in his victory, though he’s still worried about Inky. Suddenly, the Yen Bros and their goon squad burst in, intent to kill Tattoo. What they get, instead, is a beat down from Don, Mike, Splinter, April and Warrior Dragon. The Yen Bros attempt to flee but are summarily mauled by the ferocious Inky. When the bloodbath ends, Tattoo is happily reunited with his lovable pooch. Back at his home, Tattoo presents Leo with a heartfelt thank you gift: a very old and very special katana. *This story is continued from TMNT Adventures #31. The story continues in TMNT Adventures #33. *Tattoo and Inky will return in the back-up story in April O’Neil #1. *Apparently, the alien entrepreneur, Stump, has set up his own wrestling company on Earth. 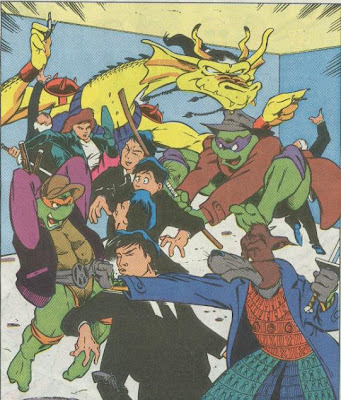 The Turtles first encountered Stump and Co. in TMNT Adventures #7. *Tattoo appeared in only one episode of the Fred Wold animated series, “Planet of the Turtleloids, Part 1”. There, he was actually a hamster that was briefly mutated into a humanoid sumo wrestler by Shredder (and was ultimately returned to normal). *This issue also included a bonus pin-up of Tattoo by Eric Talbot. *This issue was reprinted in the UK by Fleetway as TMHT Adventures #60. It’s been, like, forever since we had a good ole fashioned Playmates toy promotion issue in TMNT Adventures. 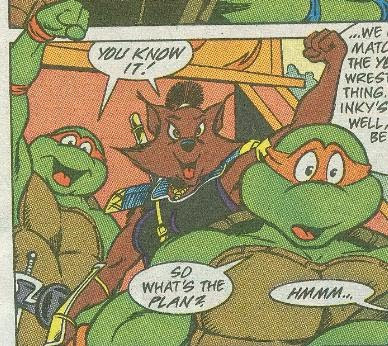 The first few arcs of TMNT Adventures were very heavy in the toy-shilling department, primarily because the series was co-plotted by Ryan Brown at the time, and he was sort of Mirage’s liaison to Playmates. When Dean Clarrain (Stephen Murphy) took over all the plotting duties for the series, the book quickly deviated away from promoting Playmates products. Sort of a double-edged sword, if you ask me. 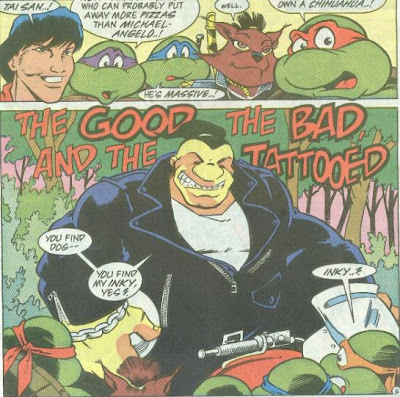 While it helped TMNT Adventures regain some integrity as a genuine source of storytelling over commercialism, and provided Clarrain with increased freedoms from corporate advertisers, it also meant that a number of the really neat characters exclusive to the Playmates toyline would never see any fiction. Yeah, sure, no big loss on guys like Monty Moose and Hot Spot, but c’mon, don’t try and tell me you wouldn’t have liked to have seen a story involving Pizzaface. An insane, peg-legged Italian chef who chops off his own fingers and uses them as toppings on tainted pizzas that he subsequently force-feeds to the Turtles until they die? 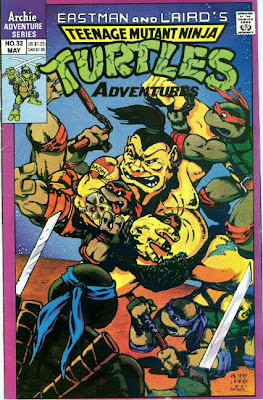 So with that in mind, TMNT Adventures #32 with its mostly one-shot nature spotlighting a character from the Playmates toyline sort of feels like the early days of the book, but in a good way. Tattoo, as a character, kind of falls flat and I was rather disappointed that he didn’t join in on the fight against the Yen Bros goons at the end (and the fact that he needed protection throughout the issue makes him come off as all show, no substance when it comes to heroics). Inky was the real star of the show: I love that little guy. His wacky design seems a tad incongruous with the aesthetic tone of the book, but that’s one of the things that makes him stand out so much and, quite honestly, he has twice the personality in just his expressions and mannerisms than Tattoo does with all his dialogue and page-time. Ninjara certainly seems to be turning over a new leaf mighty quickly, doesn't she? Just two issues ago, she was attempting to unleash global genocide on all of humanity. Here, she’s righteously raising her fist into the air and cheering loudly at the prospect of rescuing a Chihuahua. I… didn’t care much for Barry Grossman’s coloration of Tattoo as being ridiculously yellow, though I’ll cut him some slack and presume he was just sticking to the colors of the toy. All the other Japanese people in the issue have less offensive skin tones. Anyhow, this was a fun change of pace for the series, veering away from epic multi-parters and environmental messages just to give us a fun little story about one of the toys from Playmates. And Inky freakin’ rules. Hey, Mark, do you remember if there were Inky back-up stories in the early issues of Mirage Volume 2? I seem to remember them being in two or three issues.